GopherCentral Library: Where is William Peterson? Two of my favorite gritty crime dramas of the '80s, To Live and Die in L.A. and Manhunter, star today's featured celebrity -- William Peterson. 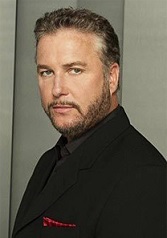 Most will remember Peterson as Gil Grissom in the CBS drama series CSI: Crime Scene Investigation. My Dad loved that show! He watches anything with an acronym in the title: CSI, NCIS, NYPD Blue, JAG, M*A*S*H, I think that's all of 'em! Without further ado, let's see what William Peterson has been doing. I added a few new celebs to our celebrity suggestions list very recently so be sure to go to Celebrity Suggestions check out who's in the running and vote or send in your suggestions. Oh, and be sure to check out our Facebook page Where Are They Now on Facebook. Please follow us, like us, and share us. It's much appreciated! WATN will be posting new issues, classic issues, and movies reviews, which can also be seen on our website at the Movie Review Directory. And be sure to visit Celebrity Nooz for all things entertainment! Georgia Engel: Played Georgette on the TV series "The Mary Tyler Moore Show", also appeared on the series "Coach" and "The Betty White Show"
Greta Garbo: Big Hollywood star from Sweden who abruptly quit show business and went into seclusion, starred in "The Kiss", "Anna Karenina", and "Ninotchka"
CLAIM TO FAME: William Petersen is an American actor and producer best known for his role as Gil Grissom in the CBS drama series CSI: Crime Scene Investigation (2000-2015), and for starring roles in films To Live and Die in L.A. (1985) and Manhunter (1986). FAMILY LIFE: He has been married to Gina Cirone since June 14, 2003. They have two children. He was previously married to Joanne Brady; together they have one child. INFO: Started at Idaho State University on a football scholarship, where he found acting. Co-founder of the Remains Theater Ensemble. He has a production company called High Horse. An avid Chicago Cubs fan, he sings "Take Me Out to the Ball Game" during the seventh-inning stretch at Wrigley Field every year and also narrated the documentary Wrigley Field: Beyond the Ivy (2001) about Wrigley Field. TRIVIA: Attended Bishop Kelly High School in Boise, Idaho. He wears his old football jersey from that school in most of his movies. Testified before the Senate Judiciary Committee on increased funding for crime labs. Attended the renowned Steppenwolf Company. Because his role in Manhunter (1986) was so emotionally exhausting, he did everything he could to rid himself of the Will Graham character after filming was completed. This included cutting his hair and dyeing it blonde, and shaving off his beard. WHERE IS HE NOW: Peterson has not been on TV since 2015, with series Manhattan. It seems that he's returned to the stage, in 2017 with The Minutes, although he's regular appeared there his entire career. 1995 In the Kingdom of the Blind, the Man with One Eye Is King...Tony C.
Alex Boraine, 87, South African politician. Dynamite Kid, 60, British professional wrestler (WWF, Stampede). Thor Hansen, 71, Norwegian poker player, cancer. Inge Johansen, 90, Norwegian engineer and educator, Rector of the Norwegian Institute of Technology (1976-1984). Mykola Rushkovskyi [uk], 93, Ukrainian actor. Pisan Akaraseranee [th], 73, Thai actor and film director. Peter Armitage, 78, British actor (Coronation Street, Jack the Ripper, Hearts and Minds). Nh. Dini, 82, Indonesian novelist, traffic collision. Selma Engel-Wijnberg, 96, Dutch Holocaust survivor, escapee from Sobibor. Joseph Christopher Garcia, 47, American convicted murderer (Texas Seven), execution by lethal injection. Michael McComie, 46, Trinidadian football player and coach (Joe Public), brain tumour. Sidy Lamine Niasse [fr], 68, Senegalese press owner (WalFadjri). Sam Nover, 77, American sportscaster (NBC, WPXI). Robin des Champs, 21, French racehorse. Nika Rurua, 50, Georgian politician, Minister of Culture (2009-2012), heart attack. Jael Strauss, 34, American fashion model and television personality (America's Next Top Model), breast cancer. Markus Beyer, 47, German Olympic boxer (1992, 1996), WBC super middleweight champion (1999-2000, 2003-2004, 2004-2006). Andrei Bitov, 81, Russian writer. Philip Bosco, 88, American actor (Lend Me a Tenor, Working Girl, My Best Friend's Wedding), Tony winner (1989), complications from dementia. Albert Frère, 92, Belgian businessman. Florence Hui, 44, Hong Kong politician, Undersecretary for Home Affairs (2008-2017), breast cancer. Toby Jessel, 84, British politician, MP (1970-1997). Kim Chol-man, 98, North Korean politician and military officer, bladder cancer. Mendi Msimang, 78, South African politician, Treasurer of the African National Congress (1997-2017). Geoff Murphy, 80, New Zealand film director (Goodbye Pork Pie, Young Guns II, Under Siege 2: Dark Territory). Josep Lluís Núñez, 87, Spanish businessman, President of F.C. Barcelona (1978-2000). Samuel Noordhoff [zh], 91, American physician. Miguel Primo de Rivera y Urquijo [es], 84, Spanish aristocrat (Duke of Primo de Rivera) and politician, Mayor of Jerez (1965-1971) and Senator. Kenneth Yen, 53, Taiwanese businessman, Chairman of China Motor Corporation and Yulon, esophageal cancer. Séry Bailly, 70, Ivorian writer and politician, Minister of Communication (2002-2003), complications from surgery. Wilmer Clemont Fields, 96, American Baptist newspaper editor. Jean-François Ballester, 53, French figure skating coach, heart attack. Ugo De Censi, 94, Italian-Peruvian priest. Vladimír Plešinger [cs], 80, Czech hydrogeologist and travel writer. Luan Qerimi, 89, Albanian actor. Paul Sherwen, 62, English racing cyclist (1987 National Champion) and sportscaster, heart failure. Michael James Snyder, 68, American business executive, CEO of Red Robin (2000-2005), suicide by gunshot. Ken Berry, 85, American actor (F Troop, Mayberry R.F.D., Mama's Family). Taramon Bibi, 62, Bangladeshi independence militant (Mukti Bahini), respiratory failure. Averroes Bucaram [es], 64, Ecuadorian politician, Speaker of National Congress (1985-1986, 1990) and MP (1984-1986, 1988-1992). Ennio Fantastichini, 63, Italian actor (Open Doors, At the End of the Night, Loose Cannons), Donatello winner (2010), leukemia. Frederick Fasehun, 83, Nigerian physician and politician, founder of the Oodua Peoples Congress. Anwar Hossain, 70, Bangladeshi photographer. Ivan Katardžiev, 92, Macedonian historian. Phineas Makhurane, Zimbabwean academic, Vice-Chancellor of the National University of Science and Technology. Dave Mantel [nl], 37, Dutch actor (Goede tijden, slechte tijden). Bernd Martin, 63, German footballer (VfB Stuttgart, Bayern Munich, West Germany). Judy McBurney, 70, Australian actress (Prisoner, Always Greener, The Young Doctors), cancer. Patricia Head Minaldi, 59, American federal judge, United States District Court for the Western District of Louisiana (since 2003). Calvin Newborn, 85, American jazz guitarist. Maria Pacôme [fr], 95, French actress. Pauls Putninš, 81, Latvian playwright, journalist and politician. Scott Stearney, 58, American vice admiral, Commander of the Fifth Fleet (since 2018). Marvin Terrell, 80, American football player (Dallas Texans, Kansas City Chiefs). Stefanie Tücking, 56, German radio and television presenter (Südwestrundfunk). Jody Williams, 83, American blues musician, cancer. Zhang Ouying, 43, Chinese football player (China national team) and coach, lung cancer. Jon Ramon Aboitiz, 70, Spanish-Filipino businessman (Aboitiz Equity Ventures). Roger V. Burton, 90, American actor and musician. George H. W. Bush, 94, American politician, President (1989-1993), Vice President (1981-1989), Director of Central Intelligence (1976-1977). Fred Caligiuri, 100, American baseball player (Philadelphia Athletics). Chang Guitian, 76, Chinese xiangsheng actor. Attash Durrani, 66, Pakistani linguist and gemologist. Palden Gyatso, 84-85, Tibetan Buddhist monk and political prisoner. Sandro Mayer [it], 77, Italian journalist. Joseph L. Tauro, 87, American federal judge, United States District Court for the District of Massachusetts (since 1972). Harvey Tyson, 90, South African journalist and editor. Cyril Woolford, English rugby league footballer (Castleford, Doncaster, Featherstone Rovers). Harue Akagi, 94, Japanese actress (Magic Boy, Bushido, Samurai Saga, Pecoross' Mother and Her Days). John D. F. Black, 85, American screenwriter and producer (The Mary Tyler Moore Show, Star Trek). Elisa Brune, 52, Belgian writer. Altaf Fatima, 91, Pakistani novelist and writer. Yves Gasc [fr], 88, French actor. Eldon George, 87, Canadian fossil hunter and geologist. John Gibson, 85, Scottish journalist. Ruth Haring, 63, American chess player. Ralph Hodge, 65, American college basketball coach (Olivet Nazarene). Garnik A. Karapetyan, 60, Armenian mathematician and academic. Ulrich Leyendecker, 72, German composer. Erik Lindmark, 46, American vocalist and guitarist (Deeds of Flesh) and record label owner. Hans Maier, 102, Dutch water polo player. Viktor Matviyenko, 70, Ukrainian football player (Dynamo Kyiv) and manager, Olympic bronze medalist (1976). Robert Plotnik, 75, American record store owner, complications from a stroke. Miguel Romero Esteo, 88, Spanish writer and playwright. Otto Stark [de], 96, Austrian actor. Thomas J. J. Altizer, 91, American theologian, stroke. Roger Cans [fr], 73, French journalist (Le Monde). Nicanor de Carvalho, 71, Brazilian football manager (Paulista, Ponte Preta, Shonan Bellmare), heart attack. Mark Farrell, 65, British tennis player. Richard Fulton, 91, American politician, member of the U.S. House of Representatives from Tennessee's 5th district (1963-1975), Mayor of Nashville (1975-1987). Alixe Gordin, 96, American casting director (Klute, Scarface, Prizzi's Honor). Yvan Griga, 55, Swiss ice hockey player. Gary Haisman, 60, English musician. Masahiko Katsuya, 57, Japanese columnist and photographer, alcoholic hepatitis. Lubomír Kostelka [cs], 91, Czech actor, heart attack and pneumonia. Andrea Milani, 70, Italian mathematician and astronomer. Robert Morris, 87, American sculptor, pneumonia. Roger Neumann, 77, American jazz saxophonist. Zulkifli Nurdin [id], 70, Indonesian politician, Governor of Jambi (2005-2010). Alireza Rezae [fa], 43, Iranian political dissident, writer and comedian, cardiac disease. Blaže Ristovski, 87, Macedonian linguist and historian. Georgie Salter, 67, New Zealand netball player (national team) and coach (Otago Rebels). Harry Leslie Smith, 95, British writer and political commentator, pneumonia. Goran Stefanovski, 66, Macedonian playwright. Piera Vidale [it], 74, Italian actress. Cal Worsham, 55, American mixed martial artist.